Ruthiebear (Titusville, NJ, United States) on 10 April 2015 in Art & Design. Not to be no longer protest. It's the first bite of the apple will solve everything. j'aime beaucoup ! ***** bonne journée Ruthie ! Fascinatingly clever artwork - it creates so much from so little. Avec le reflet en plus dans la pomme ... : photo géniale et une oeuvre d'art intéressante. Yes wonderful abstract association to the old story! A very upscale Eve. Like seeing your reflection, too. I didn't know Adam and Eve had a photographer recording their great misstep. I can see you in there on this delicious green apple..Hmmm...wonder what Eve used for nail Polish !!!! Excellent composition avec un ........auto portrait !!! Excellent composition with ........ self portrait !!! Self portrait in an apple, but are you wearing an Apple watch and carrying an iPhone? Or is this anti-symbolic. 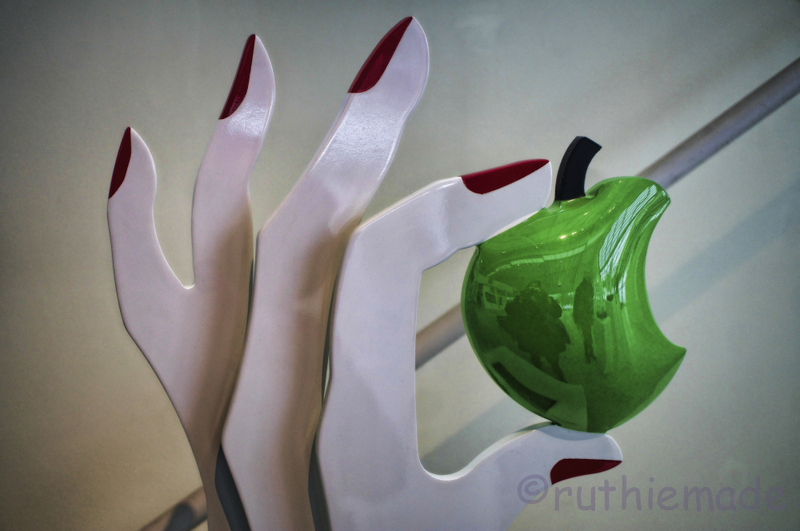 Love the reflection of you in the tart green apple ... neat sculpture and photo! Since this reminds you of Adam & Eve, the title is appropriate. Great photo !!! That is a very cool sculpture. such beautiful composition, focus, colors, lighting & title! Yes - definitely has an Adam and Eve feel to this.